Anderson Roofing Company prides itself on providing a safe and challenging workplace for its employees. Our employees average 15 years with the company for a reason – we offer competitive compensation and benefits packages AND it’s a great place to work. We’re always on the search for highly motivated candidates. If you have a positive attitude, work well in a team environment and are drug-free Anderson Roofing may be the place for you. 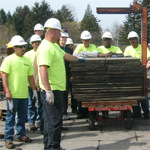 Anderson Roofing values diversity and is an equal opportunity employer. Copyright © 2010 Anderson Roofing Company, Inc. All rights reserved.